If you missed the live presentation of the 2019-20 federal budget last Tuesday then let me just say from the outset: that is 100% understandable. Married At First Sight was on Channel 9 and we all have to live our truth. Yet, as you may have heard, it was actually quite a big one for our sector. But never fear, by the end of this article, you will be up to date on what the budget entailed for the disability community. One thing to bear in mind is that there will be an election in May. If the Opposition wins, then the current government will not have the opportunity to legislate on their budget. So we will also be covering relevant parts of the Opposition’s budget reply speech. Truthfully, it is hard to know what will happen into the future. They say that a week is a long time in politics; well a financial year is perhaps an eternity. One of the biggest stories to come out of the federal budget has been the return to surplus. But where does this extra money come from? 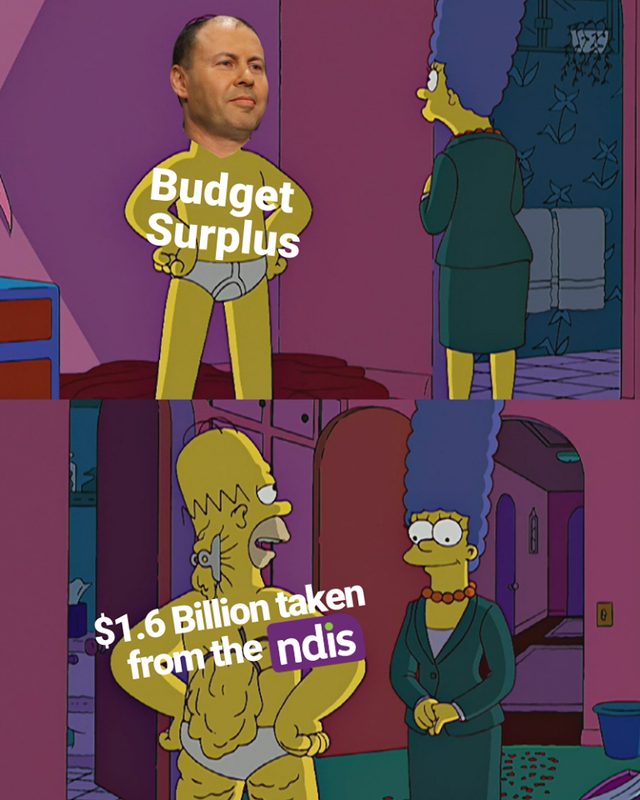 As you have probably heard, 23% of the $7.1bn surplus comes from our very own NDIS. The budget revealed that there was a $3.8 billion underspend in NDIS spending over the last financial year. Naturally, many disability advocacy groups and service providers were quite irate upon learning this. The implementation of the NDIS has not exactly been a smooth sailing ship. $3.8bn could have gone a long way. In the background of every reasonable and necessary or access battle that the Agency has fought tooth and nail over, there was $3.8bn just waiting to be withdrawn. The Opposition Leader used his budget reply speech to slam the government for short changing the NDIS by $1.6bn. He reaffirmed Labor’s promise to lift the staffing cap on the NDIA. The budget has confirmed that there will be a royal commission into violence, abuse, neglect and exploitation of people with disability. It has been allocated $527.9m over 5 years, making it the most expense royal commission in Australia’s history. This includes $379.1m for running the inquiry and giving legal assistance to witnesses, and $148.8m for counselling and support for people with disability who participate. The Prime Minister formally launched the royal commission later in the week, naming the Chair and the five assistant Commissioners. This was shortly followed by calls for two of the Commissioners to step down due to their roles as senior bureaucrats in disability services. Advocates believe that this represents a conflict of interest in their ability to be objective about the performance of these services. So one day in, there was already a bit of #controversy. People with disability who are working and receiving social services payments at the same time will also be impacted by the changes to income reporting. Income will now be reported when it is received, not when it is earned, through a single touch system. This is meant to make reporting easier, reduce associated debt and save the government $2.1bn in over payments. I mean nothing has ever gone wrong when Centrelink has implemented an automated system before, right? An additional $84.3m has been invested in services for carers. This partly takes the form of packages valued at up to $3,000 for 5,000 carers. And if you are thinking “But that’s not many?” then congratulations because you are correct. Only 0.18% of Australia’s 2.7 million carers will receive these packages. 25% of the packages are being reserved for young carers. The Department of Social Services is also currently testing and designing new phone counselling, online peer support and coaching services for carers, and will be releasing a range of new educational resources. You can find more information about the new carer services here. $54m for new residential centres for eating disorders. One of the most exciting promises is $114.5m for 8 new walk-in mental health centres for adults. Hopefully, this will go some of the way towards addressing the closure of mental health programs due to the roll out of the NDIS. A tiny, blink and you will miss it, budget measure was $300,000 for not-for-profit e.motion21 to trial a program to increase workforce participation for adults with Down Syndrome. While it is hardly big bucks, it is exciting to see the government exploring new ways of supporting people with disability to find employment. We all know much more work is needed in this space, so hopefully we will see more initiative programs funded in future years. Newer PostAre Your Service Agreements Non-Compliant?